The Global Warming Policy Forum is a London-based think tank which conducts campaigns and activities which do not fall squarely within the Global Warming Policy Foundation’s remit as an educational charity. This arrangement reflects those used by other organisations with dual structures, such as Amnesty International UK and Greenpeace UK. 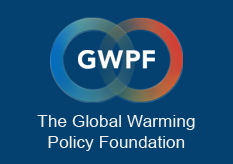 In recent years, the GWPF’s influence has grown rapidly, among both UK and international policy makers and the news media and is widely regarded as one of the world’s leading think tanks on global warming policy issues. The Forum is a wholly-owned subsidiary of the Global Warming Policy Foundation. Climate science and climate policies are faced by rising doubt and criticism. There is growing concern about the integrity of climate scientists and the maltreatment of sceptical researchers. The Forum will be campaigning for more balanced and more transparent assessments of climate science and policy research. Climate alarmism suffers from a manifest lack of scientific scrutiny. Instead of carefully assessing the quality and reliability of climate data, many climate scientists cherry-pick numbers and interpretations that seem to confirm their alarmist conviction. Reliable and trustworthy science requires a sober and detached consideration of all relevant evidence. The Forum will campaign for an open scientific debate which allows for all reasonable arguments and criticism to be voiced and published. The coverage of climate change in the news media has been strongly biased in favour of alarm. For far too long, scientific organisations and the mainstream media have failed to give appropriate space to authoritative critics of climate alarmism. The Forum will campaign for more objective media reporting. European and other governments have burdened their countries with unilateral and hugely expensive climate and green energy targets. As a direct result, energy prices and fuel poverty are rising in many countries, making them poorer and less competitive. Rejecting economically damaging climate and energy policies, the Forum will be campaigning for cost-effective alternatives that will help to make our societies more resilient and more competitive. The inability of the international community to agree legally binding CO2 reduction targets shows that unilateral climate policies have failed. The Forum will be campaigning for the development of alternative approaches that are politically realistic and economically feasible. The Global Warming Policy Forum will be funded by private donations. In order to make clear their complete independence, neither the Foundation nor the Forum accept gifts from either energy companies or anyone with a significant interest in an energy company.